A RhinestoneSash exclusive - This adorable perfect mint veil has four-layers of tulle to give it premium look and feel that the Bride will love. Give it to the Bride to wear to her Bachelorette Party or any pre-wedding party. The Veil easily attaches using a single clear comb. Pair it with a Bride-to-Be Tiara for a fun party look. Order this stunning Veil today, it's sure to be a keepsake the Bride will love! Click "Add to Cart" now!" EXCLUSIVE - Perfect Mint Veil! The Bride will stand out from the crowd in this stunning Veil. QUALITY - Premium Four-Layers of Tulle! This veil will look stunning on the bride with it's luxurious layers of tulle. KEEPSAKE - A Gift The Bride Will Love! The Bride to Be will love that she can hold onto this keepsake veil. It will reminder her of her Bachelorette everytime she sees it. PERFECT FIT - Attaches with a single Clear Comb! Our Veil is designed to fit perfectly, stay in place and keep the Bride looking fabulous no matter how wild the party gets. A BACHELORETTE PARTY SHE WON'T FORGET!. Click "Add to Cart" now! 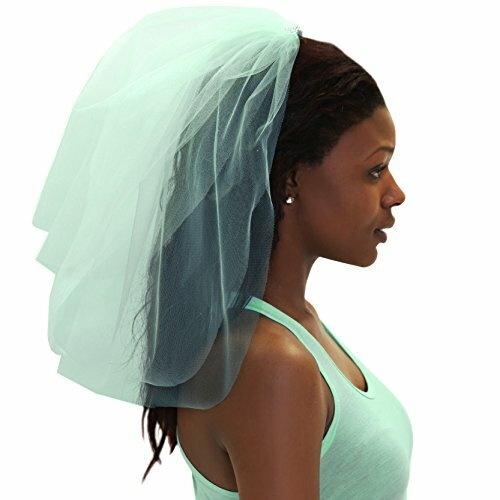 This Veil is perfect for pictures and the perfect mint color will grab lots of attention at the Bachelorette Party. The Bride to Be will look beautiful, have lots of laughs and is sure to turn heads in this veil.